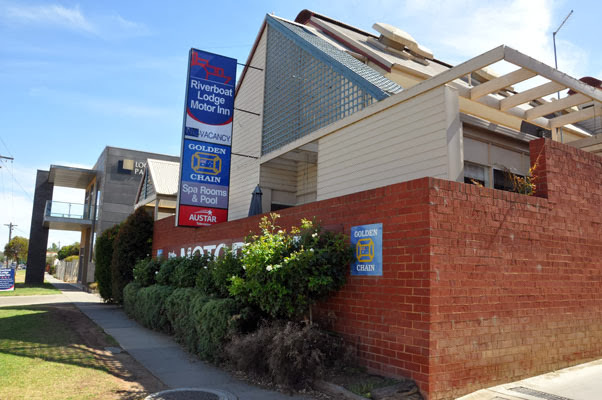 a bit of everything: The RiverBoat Lodge at Echuca! The RiverBoat Lodge at Echuca! Recently we traveled by train to Echuca, just for a few days ... Echuca is a town located on the banks of the Murray River and Campaspe river in Victoria, Australia. We decided at the last moment to leave on the Wednesday. I quickly looked on-line for accommodation, discarding any that did not have a website! We needed to locate any accommodation within walking distance to the town as we were traveling up by train and wanted to walk to any of the tourist area's. Our first call was to the Campaspe Lodge for accommodation but found they were already fully booked. The next one on the list was the Riverboat Lodge. Our location in the heart of Echuca! 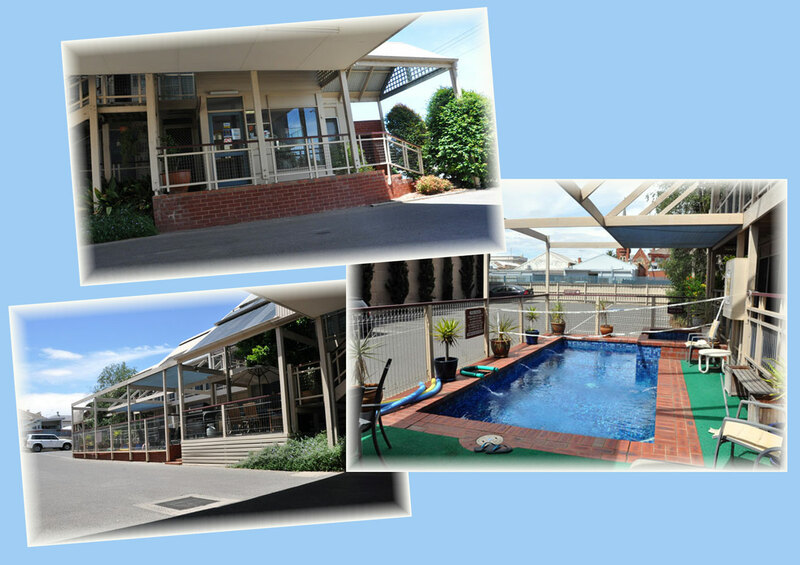 The Riverboat Lodge Motor Inn boasts one of the most central locations in Echuca. Leave your car with us and simply walk to the heritage port area, shop in the variety of stores in High and Hare Streets and dine in the local cafes, restaurants clubs and pubs. If you choose to visit by train, bus or plane we offer a free courtesy bus pickup and return on your departure! When I called, the manager (Grant Casbolt) was very pleasant and offered a "three night package" to which we accepted. The package included breakfast each morning, a dinner voucher at Antonio's Restaurant for $40.00, a "Devonshire Tea" for two at the Wisteria Cafe, pick up and drop off at the rail station and a cruise on the Murray River onboard the EmmyLou. When I enquired about the WiFi he also added that into the 'deal' as well. I find it strange that hotels and motels usually charge extra for a service that should be free. Or at the very least, packaged into the room cost. In all of the traveling we have done, certainly in the past six years, we have never had to pay the extra daily fee for WiFi ...... . except of course when we were at The Westin in Berlin! Anyway, it was included in this 'three night package' so we were grateful. DELUXE SPA ROOMS - Queen sized bed, electric blanket, direct dial phone, refrigerator, tea & coffee making facilities, toaster, microwave, table & chairs, sofa, 32" LCD TV, DVD player, AM-FM clock radio, R/C air conditioning, hair dryer and ironing facilities and large 2 person spa in bathroom. Now I have read the reviews on TripAdvisor and some of the negative comments written. BUT ...guests should always check the rating of the motel/hotel so they have an idea of the standard expected. 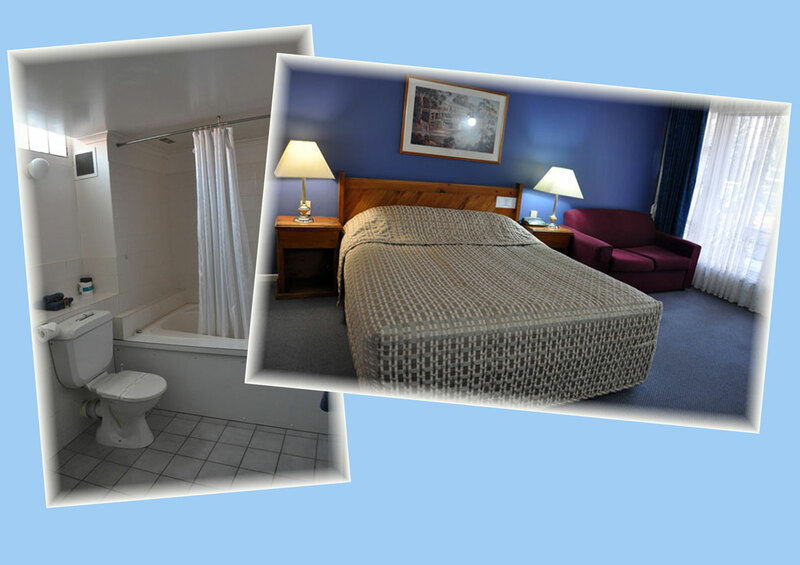 The RiverBoat Lodge is a 3.5 star motel (RACV Rating) so do not expect 5 star service! People that complain about a motel or hotel being 'old' always amaze me, how can you expect a hotel to be 'new' all the time. Even our homes become old and tired eventually! Check the websites, look at the architecture, the cost of the room, the star rating, what is included etc .. all of these will give you a clue as to what you might expect. I agree the motel is no longer bright and sparkly or brand new. If it was, you would be paying a higher price that's for sure! To me it looked rather 'tired' and certainly could do with a 'freshening'. But I did notice the manager (Grant) painting, so can only assume he is working his way around to a full makeover! The pool is very small and is located close to the rooms, its not a pool for swimming, just more for a bit of playing or a dip. The garden area needs a little TLC, but even that is not a 'complaint'. Like anyone else, I am very happy to stay in 5 star resorts, but if there are none available or cost is the issue, then you need to rethink the situation. Just so long as it is clean and comfortable, the people are friendly, the service is good and it's value for money, then that's all I ask for. We found the RiverBoat Lodge to be fairly good value for the "three day package" that we had booked, plus Grant and the cleaning staff were very friendly and helpful at all times. Customer Service is always top of our priority list! RiverBoat Lodge is ideal for a 2 or 3 night stopover and is in walking distance to town and all the restaurants. the above blog post was not for a social media event, this particular post is for the interest of our loyal followers !! We, however, are available for Social Media work at anytime. Be it bakeries, restaurants, festivals, wineries, galleries, cafes, coffee shops, markets or anything that needs to have some focus and would be of interest to others! !